On floor 22 of Roosevelt’s Wabash Building, resident assistant Brandon Rohlwing makes the rounds. Knocking on doors and making introductions, the 20-year-old integrated marketing communications major may ask out of respect how one prefers to be addressed. However, there is no pressure to indicate male, female, he, she, or lesbian, gay, bisexual, transgender, questioning, intersex, ally, or for that matter, to give an answer at all. “I don’t try to make assumptions about students and their gender or sexual orientation,” said Rohlwing, whose experiences growing up included being bullied, deciding how to come out as gay and coping with his sister’s suicide. “We are a floor that encourages everyone to embrace who they are,” said Rohlwing of the residence hall’s living-and-learning community that is home to 38 students. “And there are no questions asked.” Developed by a 17-member task force of Roosevelt students, administrators and faculty during 2012-13, the University’s gender and diversity inclusive housing policy is being praised as among the most exemplary in U.S. higher education today. “In terms of innovation and practice, Roosevelt’s program stands out as a model,” said Jason C. Garvey, assistant professor of higher education at the University of Alabama and editor of a forthcoming book on gender-inclusive university housing with a chapter on the Roosevelt experience. This fall, Rohlwing has enlisted fellow students on his floor to draft a constitution of bylaws for the gender and diversity inclusive community. He held a significant program open to the entire Roosevelt community on suicide prevention in September. He also launched a movie series for residents on his floor for LGBT History Month in October. Now in his second year of implementing the new program, Rohlwing is blazing a trail for the University and for higher education, according to Bridget Collier, chief of staff to the president and head of the task force that developed the policy. “He’s creating a buzz about the program with students and externally that is making the project a model for anyone in higher education who is contemplating a gender-inclusive housing option,” she said. Approximately 140 universities – out of an estimated 4,000 – take into account gender and sexual orientation preferences when placing students in housing, according to Campus Pride, a not-for-profit organization for student leaders and campus groups devoted to creating a safe college environment for LGBT students. Few have the kind of all-inclusive environment that Roosevelt – with its mission of social justice – has established, said Collier, whose task force refused to follow the lead of higher-education institutions with “gender neutral” policies. Instead, the task force chose the term “gender and diversity inclusive” and a policy that asks all students applying for campus housing to check a box if they have interest in living in a gender and diversity inclusive community. “We’ve created an entire learning community based on inclusion and we are saying that anyone interested in exploring gender identity and diversity can live in the community – and we don’t out our students in the process,” added task force member Jennifer Tani, Roosevelt’s assistant vice president for community engagement. When Rohlwing first came to Roosevelt as a freshman in the fall of 2012, neither spearheading the model initiative, nor becoming a student leader, were at the forefront of his agenda. His older sister had just committed suicide and Rohlwing wasn’t sure he would like college, as previous school experiences growing up in tiny, conservative West Dundee, Ill., had been challenging. While he tried being a typical, suburban, heterosexual boy, kids at his middle school mocked and tormented him for being different and repeatedly called him “gay.” Rohlwing stopped being timid in seventh grade after kids urinated through the slats of his gym locker onto his clothing, laughing when he came back from gym, unknowingly put the clothes on and wore them to class. “At the time, I didn’t feel I had a voice to do anything about it,” said Rohlwing, who recalls his horror in class upon realizing he reeked of urine. “But it was definitely an incident that stuck with me and changed me.” In high school, Rohlwing grew confrontational, sticking up for others who were taunted as being gay. “I’d answer bullies with questions like, ‘Oh really? How is that gay?’ or ‘How is that homosexual? I don’t understand,’” he said. He began to be seen as someone whom others could confide in. “I remember a girl I knew in high school telling me she thought she might be bisexual. I asked her, ‘Why do you think that?’ and I told her ‘It’s fine if you are or it’s fine if you aren’t,’” he said. He came to realize, though, that he wasn’t being upfront about his own sexual identity. Ashamed and despondent, one night at his computer he searched “How can I kill myself?” A suicide prevention website, which Rohlwing blogs for today, www.reachout.org, popped up. He watched the site’s videos and read stories and tips about being gay and coming out for hours before going to his parents’ room, waking them and telling them he was gay. His father, an Illinois State Police captain, and mother, a suburban school district special education administrator, supported him. “I just knew that Roosevelt’s vision and mission would be a good fit for who Brandon is,” said his mother, Susan Rohlwing, who received a bachelor’s degree in special education from the University in 2005. She recommended the University to her son shortly after her daughter’s suicide, which occurred on the same day as her son’s high school graduation. “Because of Roosevelt, he was able to take the tragedy that we went through and become a stronger person,” she said. An honors student and among the first 600 students to move into the new Wabash Building, Rohlwing remembers touring the Chicago Campus where he liked marketing information that asked: “Does created equal mean treated equal?” “I knew it was a place that cared about the individual and that embraced individuality and I wanted to be part of it, but I was struggling emotionally,” he said. 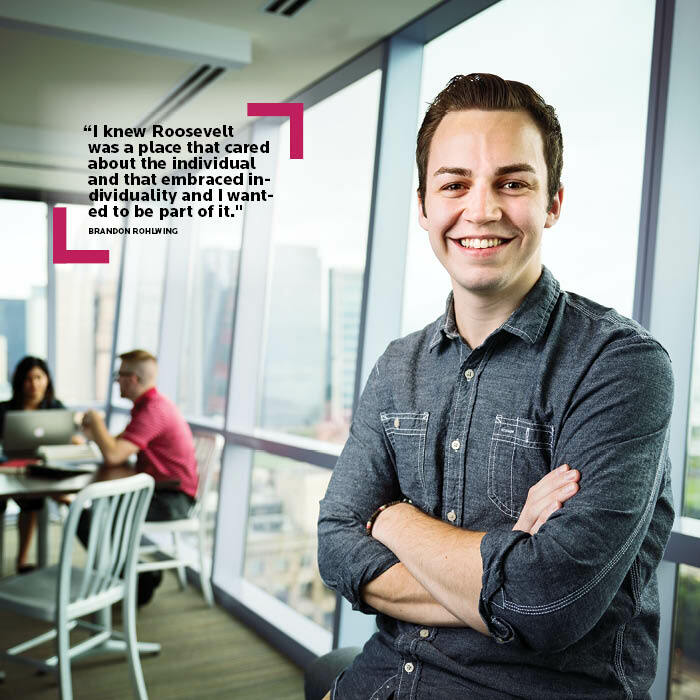 Recent Roosevelt graduate and May 2014 student Commencement speaker Brenden Paradies, a resident assistant at the time, remembers meeting the freshman. “I told him (Rohlwing), ‘If you ever need help, need to learn how to navigate things or want to get involved, let me know. I can be a resource,’” said Paradies, among six Roosevelt students who sat on the University’s gender and diversity inclusive housing task force. “I’m impressed by what Brandon has done and am glad he took advantage of the offer,” added Paradies, who gave Rohlwing advice on becoming a resident assistant. One of the first things Rohlwing does for students on his floor is give them a student-created Inclusive Dictionary with inoffensive word choices reflecting the diverse community. “I was happy to receive the information,” said Danielle Cooperstock, an undergraduate social justice major and ally of LGBT students. “It’s a great resource that is helping to increase awareness and is creating an open community,” said Cooperstock, who moved to the floor to show solidarity for student colleagues who worked on the unique gender and diversity inclusive housing policy. A volunteer for various suicide prevention programs, Rohlwing has spoken all over the world about his story and the topic of suicide. His goal, for now and the future, is to “walk the talk and help as many people as I can,” which is how his work in implementing gender and diversity inclusive housing at Roosevelt is being perceived. Design | Right Angle Studio, Inc.